Santastic – 3 Reel, 5 Payline progressive jackpot video slot featuring Wild symbols, Multipliers, Free Spins with many interesting twists and turns! This is a cute, Christmas theme slot – meet Santa and his helpers - hang a Christmas stocking and wake up to amazing presents. The minimum bet is 50 cents a payline going up to 5.00 a line or 25.00 a spin! 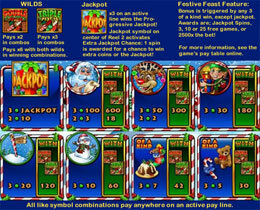 Double Wild and Triple Wild symbols are shown with 2 and 3 Christmas Stockings, these multiply all wins by 2x and 3x respectively. If both of these symbols appear together helping to create a winning combination the payout will be multiplied by 6x. During the regular game, land a Jackpot in the middle of Reel 2 to be awarded with a Jackpot Spin. All symbols in the Jackpot Spin will be greyed out except the Jackpot. 3 Jackpot Symbols will award the Progressive Jackpot which can also be won randomly after any spin! Land any 3 matching symbols on 1 of 5 active paylines to trigger this feature. Win up to 3, 10 or 25 free games, 2 500x the total bet or Jackpot spins, but be aware of the "No Bonus" field. 3 Santa symbols on an active payline will pay 100 coins; get 1 Santa together with 2 Wild symbols to win 600 credits! 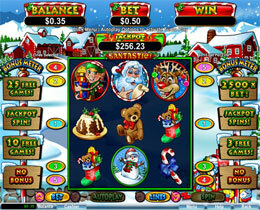 More than just cute and fun-filled, this game could become that big Jackpot win making Christmas wishes come true!